Syria, Jordan and Israel are all interesting options. None of the distances are great and the scenery and cultures fascinating. Whilst the area has been consumed by conflict for over 40 years the conditions on the ground are not normally so bad. However, the one thing an overland traveller needs to keep in mind is to keep alert for changes in the security environment. From Adana, you head south to the coastal town of Iskenderun and can cross into Syria at one of two border posts; one carries on to Aleppo and the other takes you south along the coast past Latakkia. In 1980 the coastal strip sprouted anti-craft batteries rather than tourist friendly destinations and with route being longer and the roads poorer this route did not have much to recommend it. Its one advantage was when the road forked and we selected the wrong one and snaked into Lebanon just north of the town of Qoubayet. It was just after nightfall when we encountered one of the most amazing markets of the trip. The roadside was fringed with warehouses dispensing just about any product the jaded consumer could imagine. The scene was made all the more amazing as the street was illuminated entirely by gas lanterns giving it a very exotic feel. The market was humming with hundreds of Syrians stocking up on the goods that were hard to get in Damascus - we stocked up on slabs of Heineken, cartons of Marlboro and litres of Castrol for the bus. We were excitedly surveying our goodies as the mood changed when first a Lebanese militia group and then Syrian soldiers searched the bus. Clearly they weren't after contraband! No problems and after an offer of some Marlboros we were through. Further south you come to Hama. 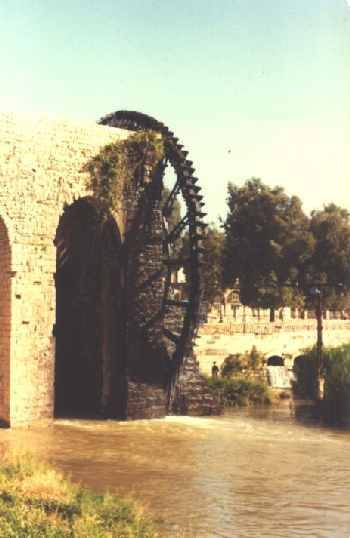 In the early eighties this city was not the place for western tourists to linger, despite the attraction of its ancient waterwheel. In 1981 when in search of a bakery we were greeted with the most blatant hostility encountered on the whole trip. It began with a group of young boys throwing small stones but the atmosphere darkened quickly and as the pebbles became stones we retreated quickly to the bus and left for Damascus. The people of Hama apparently don't just have it in for westerners as in the following year the Muslim Brotherhood led an uprising against the Syrian president Hafez el-Assad from the city. The government responded savagely with estimates of over 20,000 people being killed in the fighting and executions that followed. From all accounts it remains a sad and bleak place today. The route moves on to Damascus, the capital of Syria. The souk in Damascus is spectacular and very authentic with its traders focussed on the local market. It is probably the greatest drawcard for travellers. The pistachio ice-cream was also a highlight for me! The Umayyad Mosque, built over 1,300 years ago, is another attraction worth seeing. It is has a shrine that supposedly has the head of John the Baptist. One of our punters had a pistol pulled on him whilst trying to see John's head and not wanting to be served on a platter he bolted quickly into the safety of the crowds in the souk. Overall Damascus was a fairly safe place for travellers and many of our groups were the recipients of genuine and unsolicited gestures of friendship. Like people all over the world, Syrians respond positively when you display an interest in their country and behave in a friendly and open manner - good Aussie traits! Travellers will also enjoy the feel of the city as its architecture still wears the legacy of the French colonial occupation. On a return overland in 1980 we were denied Iranian visas and we had to overfly Iran. We departed Karachi flying Syrian Airlines into Damascus. The bus had been delayed in Amman and so we enjoyed the luxury of a hotel not far from Martyrs Square. On looking out is louvred windows you could be excused (at least for a minute) for thinking that this was France. We normally camped in a decrepit camping site just north of the city where we always appeared to be its only customers. Not the sort of place that would rate very highly on the travellers "must-see" destinations! Damascus lies close to the Jordanian border and customs formalities tended to be surprisingly swift. The most important factor to be kept in mind by travellers was that you would be denied re-entry to Syria if it became known you intended to or had visited Israel. Humour is also a very helpful weapon when dealing with bureaucracy. On one crossing the Syrian customs guys found a very realistic looking imitation pistol that our driver had purchased. He didn't look too amused with his find. I tried gesturing to him that it was a toy. I eventually got point across by mime when I put up the pistol to my head and pulled the trigger. It exploded loudly in my ear, at which he unbuckled his holster and passed his pistol to me and said "now try this one"! No more checks took place and we were waived through with a smile. 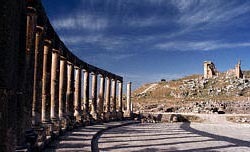 Amman, the capital of Jordan is a short drive away. Just north of the city you find the ancient site of Jerash, the ancient Gerasa, which is well worth a visit. It is referred to in the bible as being visited by Jesus and thanks to the excellent state of its preservation the traveller is easily transported back in time. The capital city offers the traveller little in the way of sight-seeing opportunities. Like Rome it's built on seven hills and in ancient times was known as Philadelphia. We camped on an empty block by the Sixth Circle not far from the Inter-Continental Hotel - it was our worst camp site of the trip. We washed and toileted courtesy of the hotel but that was an option only open to us during the day. Walid, our contact in Amman, also helped make the stay more pleasant. He lived nearby in a very fashionable part of town with his Irish mother and Jordanian father. We spent many a night smoking, drinking and playing billiards at his place. Above his billiard table was a frame bearing the soiled underpants of the then crown prince, now King of Jordan, who allegedly lost a bet with Walid. However the biggest surprises for travellers lie further south. The Dead Sea, Petra, Wadi Rum and Aqaba are all worth a visit. From the Dead Sea it is possible to cross by foot into Israel. Travellers thinking of taking this option are advised not to bring any evidence of this trip back with them – that means coins, banknotes or postcards. The established practice is for the Israelis not to stamp your passport but it doesn’t hurt to make sure they don’t! In those days we drove down towards the Jordan River close to the Allenby Bridge and parked in a desolate area thats only building were some incongruous looking tin bus shelters. A local bus would then ferry you to the bridge where on the Israeli side you enter a huge western-style customs area. With the customs formalities completed the most amazing 45 minute car ride of your life lies ahead of you as you are whisked from Asia back into Europe. We hired a number of large taxis and headed straight for Jerusalem. The road out of the west bank climbs steadily for just about the entire trip. At first the landscape looks more like a moonscape but it slowly changes as more Arab villages appear. Small olive groves punctuate the stone and dry pastures with the occasional pocket of cultivation reminding you that people do live here. Increasingly donkey carts, belching diesel trucks, Mercedes taxis and buses begin to compete with you for ownership of the road. As you approach the city the Dome of the Rock mosque and the walls of ancient Jerusalem dominate your view. We stayed in a hotel located on the Arab side of this divided city and its windows looked over the "green line" an area of land cleared of buildings that separated Jerusalem's Muslim and Jewish residents. From this hotel we had quick access to the narrow and atmospheric streets of Jerusalem through Herod's Gate. Whilst the walled city has largely become a tourist mecca Islam and Judaism's two competing shrines - the Dome of the Rock and the Wailing Wall - ensure that this remains a living and authentic place. The devotion and fervour associated with these two shrines makes Christianity's Church of the Holy Sepulchre appear slightly second-rate. The biggest culture shock of the trip awaits the traveller as they make that three hundred metre walk across the "green line" into Israel proper. In a matter of minutes you shake off Asia and are plunged back into Europe. Gone are the donkey cart replaced with BMWs, out are the falafels and in are the cappuccinos and most strikingly the absence of headscarves which have been swapped for mini-skirts and bare midriffs! For drivers and couriers Israel also meant a couple of days R&R as we left the punters to fend for themselves. On my last overland we hired a car with a couple of the girls and headed off for the Mediterranean. In Tel Aviv we relaxed on the beach surrounded by bikini wearing and gun-toting girls - everyone was armed to the teeth but all the same the mood was fairly relaxed. We motored up the coast to Haifa which still had a significant Arab population and took in places like the ruins of Caesarea, the city built by King Herod. Israel is an intriguing place that can't fail to twist and tug at a western traveller's conscience - you can't help but feel for the Palestinians who are so down-trodden and disenfranchised in their own country but at the same time you can't help but admire the Israelis for the way they have transformed this barren land into a land of plenty. On leaving Israel we moved on to one of the "resorts" on the Dead Sea. It was fairly basic but what the heck you don't get many chances to go swimming in water where you can't sink. Be warned it's VERY salty and all those scratches and nicks respond appropriately. We spent the day lying on a beach of stones interspersed with quick dips in the briny waters. Next stop was Petra, the hidden city of Nabateans, perhaps the most stunning of the ancient sites you will find on your travels overland. In ancient times Petra was an important point where the caravan routes from Arabia and Sinai merged. The site covers a huge area and shows the evidence of the changing occupation from Nabatean, Greek, Roman and Byzantine periods. In the 1980's there was only an expensive hotel so we always free-camped nearby. It gets very hot in Petra and it's advisable to arrive as early as possible so you can enjoy exploring this huge city. Like most places in Asia, you are surrounded by touts as soon as you arrive. Riding on horseback through the Siq, the narrow rocky passage, into the city is a fantastic experience and it's well-worth haggling and paying the extra to ride the horse yourself. Nothing is more annoying than being led along by someone who only wants to sell you something else! You can complete the trip by returning to Amman along the Desert Highway, with an excursion en route to Wadi Rum. This is the site where Lawrence of Arabia assembled the Arab army before taking Aqaba from the Turks in WW1. Wadi Rum is a most spectacular desert amphitheatre of a scale that must be seen to be appreciated. The people tend to friendly and hospitable to strangers but in the remoter regions travellers, both male and female, should not wear clothing that might give offence. For the past twenty-five years there has been no safe route through Iraq and so your only option is to re-trace your steps back to Adana in Turkey. On re-entering Syria you do have the option of visiting the ancient site of Palmyra. However the trip from Damascus is a long one and the following leg to Aleppo in the north, via Lake Assad, is also a tedious one.